Identify the trends behind the growth and evolution of stadium and arena design as multi-use public places. Assess the health and safety aspects of “back-of-house” and restroom areas as part of an overall high-performance design. Explain the importance of proper attention to details for the performance of critical design components, such as operable glass walls. 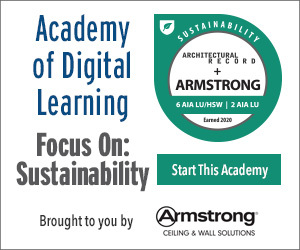 Determine ways to apply the principles as presented into building projects demonstrated through case study or project examples. Between the years 1995 and 2015, a span of only 20 years, a recent research study documented the construction of 70 major stadiums around the United States—56 between 1995 and 2009, plus another 14 between 2009 and 2015.1 On average, that is 3.5 major league sports venues being built and opened per year, which is a notably higher rate of construction compared to any previous time in the United States dating all the way back to the 1920s. In addition, there have been numerous minor league, college, or municipal stadiums and arenas built, not to mention the renovation of existing facilities or sports venues located both inside and outside of the United States. By all accounts, the appetite for sports and entertainment venues is strong. 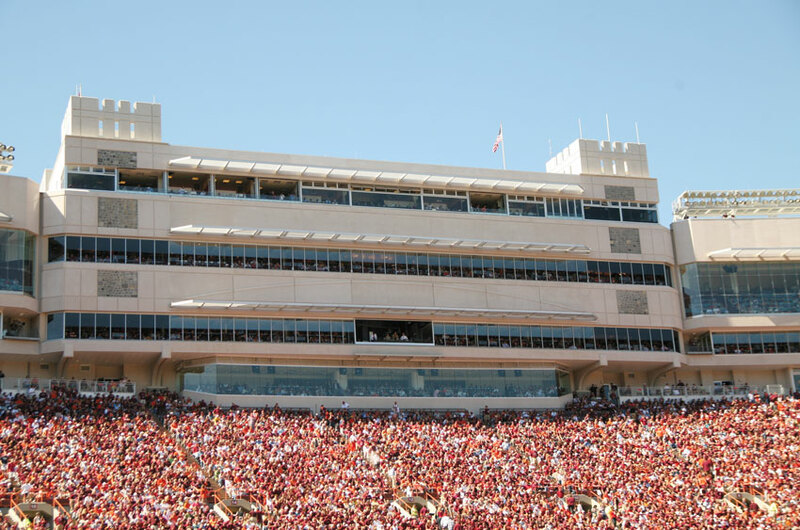 Stadiums and arenas, such as the Virginia Tech, Lane Stadium pictured here, have become larger and more diverse in their use and functionality in recent years. What’s driving all of this activity? It would appear to be multiple things. In some cases, it’s the availability of funding. In others, it’s the recognition that stadiums are helping to drive economic development or urban revitalization. In still others, it can simply be the appeal of a sport or a favorite team to support. Whatever the reason, it all spells opportunities for design and construction professionals, particularly since the average cost of these facilities can reach into hundreds of millions of dollars. In this course, we will look at several important but sometimes overlooked aspects of stadium design. As these facilities get larger and more sophisticated, the ability to create unique spectator experiences, improve durability, and provide clean, safe, comfortable amenities all become critical to good design. 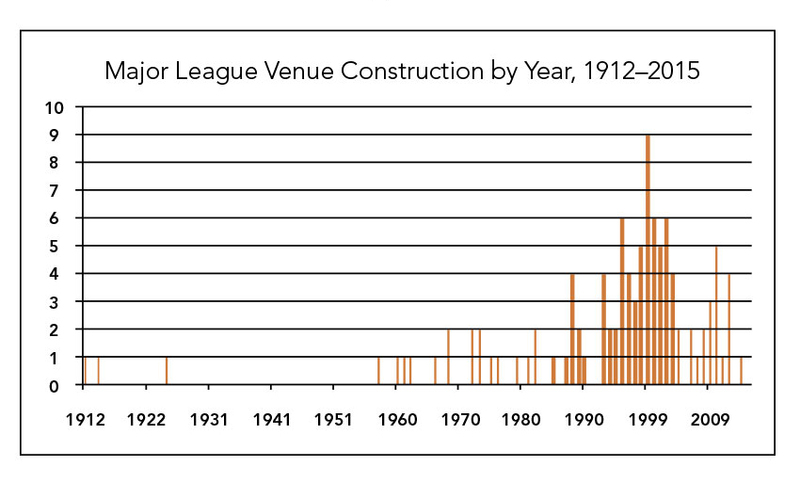 The construction of new stadiums and arenas saw a significant growth spurt between 1995 and 2015, and indications are that there is more work to come. The internationally known design firm HO+K has focused a significant part of its work on stadium (i.e., open to the sky) and arena (enclosed with a roof) designs. John Rhodes, a director of the firm’s Sports + Recreation + Entertainment group, is a recognized thought leader in this area. He has been interviewed and published based on his own experience and that of the firm about some of the changes and trends in stadium and arena work in the past decade or more.2 He notes that there has been a “clear shift away from single-purpose functional venues toward spaces that cater to a much more diverse event calendar, focused on live entertainment rather than purely sport.” This multi-use capability clearly adds to the design complexity but it also means that the facility can be used for more types and sizes of events and attract more people. He sees this trend continuing, as arenas and stadiums are being more integrated with city centers and becoming anchors of activity for urban areas. “Over the next decade, arenas will start to combine with other community components like education, science and technology, hotels, and parks,” Rhodes says. “To facilitate this, clients will want a team with specialties in all of these areas.” Clearly, the dynamics of the design and the types of criteria are expanding, requiring more professional input and synthesis into a much more complex outcome. The design professionals at HO+K and others have noted that not only is the multipurpose nature of these facilities impacting the design, but consumer preferences are also coming into play with an expectation of a higher-quality overall experience. Rhodes again notes, “The experience of going to an event needs to exceed the convenience factor of watching online or at home. Venue designers need a better understanding of how people want to use spaces and engage in an event.” With this in mind, let’s look at some specific design considerations. As fans and event attendees expect more from their surroundings, designers are starting to recognize that the in-game experience can be more important than the game or event itself. Hence, it is no longer appealing to many people to sit outside during inclement weather on a bleacher seat or in other unprotected areas. In fact, it has become more common to expect a level of experience equivalent to deluxe hotels, clubs, and restaurants with private boxes, suites, and party salons increasingly common at all levels of venues. It seems that the seating and space itself must be as competitive as the game and provide the fan or attendee with a unique and comfortable social experience. The willingness of companies and other organizations to pay for and reserve such spaces for employees, clients, friends, and family to gather in a controlled space to experience a game or event appears to be fueling the growth in the design of such spaces. One means to achieve these separated seating areas is to use operable glass walls. Using such opening glass walls in stadiums enables two key benefits. First, the flexible operability of the glass wall enables suites, gathering areas, and in-stadium restaurants or bars all to have the ability to configure the space based on the needs of the occupants or the event. For instance, when the glass wall is open, the fans experience the crowd directly, but when closed, the operable glass wall provides a transparent barrier with unobstructed viewing. In cases where the playing field is outdoors, the closed wall also provides greater human comfort with protection from wind, cold air, and noise. Secondly, when there are no events taking place, the weather-resistant opening glass walls protect interior spaces and furnishings from exposure and/or unauthorized entry. This flexibility and controllability creates a number of benefits for everyone involved, such as the stadium operator, the owner, and the attendees. For those buying tickets, the variety of choice in having separate interior spaces or the ability to create flexible suites from standard luxury boxes can be appealing. The overall design approach of providing suites that offer a unique experience for the sports fan or event attendee is enhanced by allowing the occupant the choice to easily open or close operable glass wall panels based on weather, preferences, or size of group. From a revenue standpoint, it allows a basis for different ticket prices based on the level of comfort provided, creating a higher ticket revenue than facilities without the operable wall option. Further, since the operable glass walls can create different size spaces for different events at different times, the facility has the opportunity to serve more groups with more choices in the types and sizes of events—that equates to a more continuous source of revenue between larger events. Operable glass walls are used to effectively create enhanced guest experiences at the San Francisco Giants Stadium (left) and the Chicago White Sox Stadium (right). A unique moisture management system makes TRI-Umph™ hygienic and safe by preventing stagnant water (a source for bacterial growth) and water spills (safety hazards). A triple HEPA filter fights odor and eliminates 99 percent of airborne bacteria. The product is fast (12-second drying), quiet (65–69.8 dBA), and cost effective ($26 annual electricity cost). Endurant® Washroom Systems, a division of Inpro®, fortifies washrooms against commercial demands. Our BioPrism® Solid Surface shower surrounds, receptors, and toilet partitions provide a beautiful alternative to traditional tile that can cut days off installation. And unlike grout, solid surface doesn’t harbor mold or mildew, so washrooms stay cleaner longer.